Samuel Sewall, Chief Justice of Massachusetts, was born, 28 March, 1652, at Bishopstoke, Hants, England, the son of the Reverend Henry and Jane (Dummer) Sewall, who had already been for a short season at Newbury, in Massachusetts, New England. Henry came back to America in 1659, and Mrs. Sewall, with her little family, returned to Newbury in 1661. Samuel, their second child, studied at Baddesley and Rumsey in old England, and was fitted by the minister at Newbury for Harvard, where he graduated in 1671. In a class of eleven he ranked third in social position. He had a bent for the ministry; but on marrying, 28 February, 1676, Hannah, daughter of John Hull, the mint master, he turned for three years to the more lucrative form of public influence, the printer's press, and then as a merchant rose rapidly in prosperity and public regard. It was his misfortune to be associated, in 1692, with the execution of several persons for witchcraft, that handiwork of the devil, in which all more or less believed. But he came to feel that the convictions were based on 'spectral evidence' (testimony of the bewitched that they suffered through apparitions of absent persons) evidence not valid in law; he publicly confessed his regret, and ever after showed repentance by fasting and prayer one day in each year. Sewall, although he knew little of law, except as laid down in the Bible, became judge of probate in 1717, and chief justice of the Superior Court of Judicature in 1718; he retired from both offices in 1728, and died at Boston 'at half an hour past five in the morning,’ 1 January, 1730. He had been a member of the Council for thirty-three years, and had held many other positions of varying importance. By his wife, Hannah, the judge had fourteen children, of whom Samuel, Elizabeth (wife of Grove Hirst), Reverend Joseph, Mary (wife of Samuel Gerrish), and Judith (wife of Reverend William Cooper), lived to make their place in the world. Sewall married, second, 29 October, 1719, Abigail, daughter of Jacob Melyen, and third, Mary, daughter of Henry Shrimpton. Both were widows of prominence, and in that day marriage of elderly widowers and widows was held to be a duty not to be neglected. For this reason he sought comfort in marriage after each bereavement, and his diary narrates in great detail his courtships, his rebuffs, and his conquests. But Sewall was an able and distinguished citizen, too much associated in our minds, it is to be feared, with social events which played only a minor part in the main current of his life. 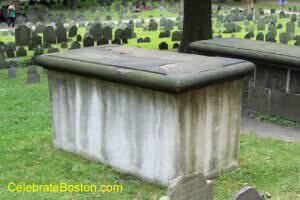 Sewall was entombed at Granary Burying Ground in Boston. His freestanding tomb is on the west side of the cemetery in center, opposite Pail Revere's marker.